I am so proud to announce my latest article in the Register-Guard: an interview with Linda Ziedrich and cookbook review of her stellar preservation books, The Joy of Jams, Jellies and Other Sweet Preserves and The Joy of Pickling. Linda was kind enough to invite me to her farm, and we spent several hours talking about the world of Willamette Valley produce and the terribl(ly delicious) things you can do to it. One recipe we didn’t have space for was the one I’ve been loving all over. Raynblest Farms still has big bags of dried Brooks and Italian (aka Fellenberg) prunes for sale at the farmer’s market, so you might want to grab a bag before last year’s crop is gone. 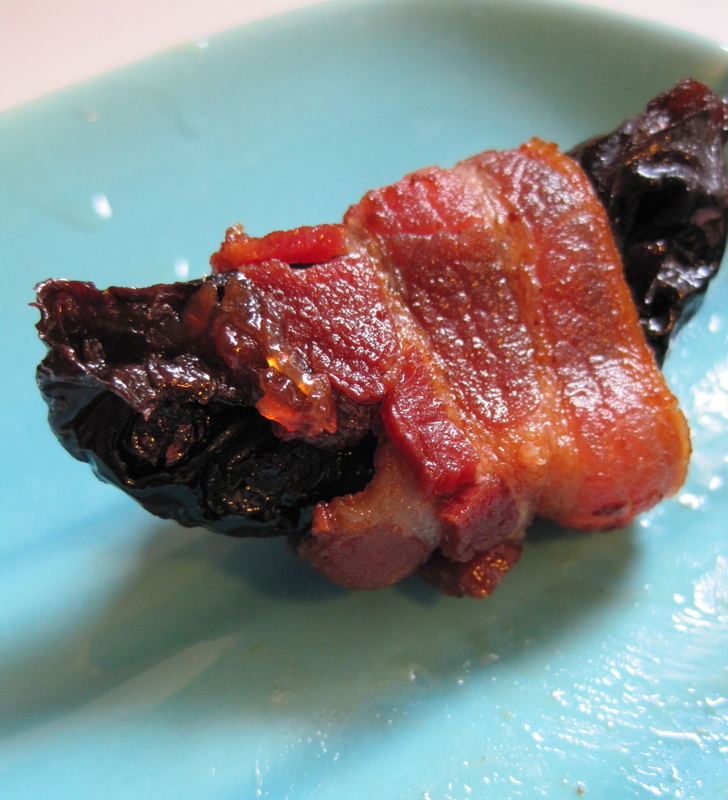 I recommend our native, big, plump Brooks prunes (front and left, versus the less fleshy and more tangy Fellenberg, back and right) for this recipe. Trust me, it will be worth it. Once you eat one, you won’t be able to stop. I tried this recipe side to side with the one posted over at NPR by the author of the blog Orangette, since Molly’s recipe follows that of the terrific artisan picklers from Boat Street. Let me just say this: the quart of Dolores is gone; the Orangette quart is still mainly full. 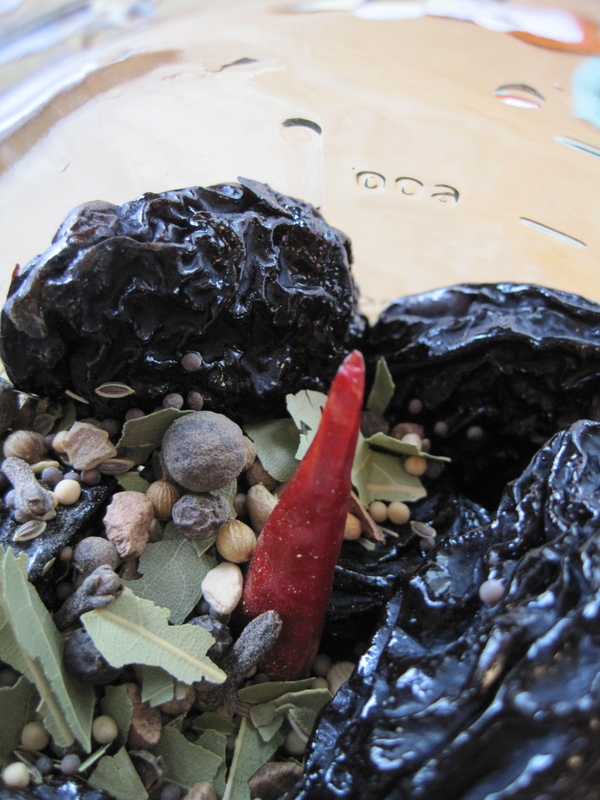 The problem with the latter is that you really need more neutral liquid to plump up the prunes when cooking, so Dolores’s addition of poaching water to the vinegar works better to flesh out the fruit so the pickling can infuse it. The experience isn’t as puckeringly sweet/sour when you eat the prunes as it is when you eat the Orangette version. Don’t get me wrong, the Orangette prunes would make a great addition, chopped in pieces, to salads and quick breads, perhaps. The taste is good. But they can’t be cut in half and wrapped with a piece of bacon and eaten in dangerous quantities because they are the most delicious morsel you’ve ever tasted. No, they just are no Dolores, our lady of prunes. Excerpted from The Joy of Pickling, by Linda Ziedrich. (c) 2009, used by permission from The Harvard Common Press. 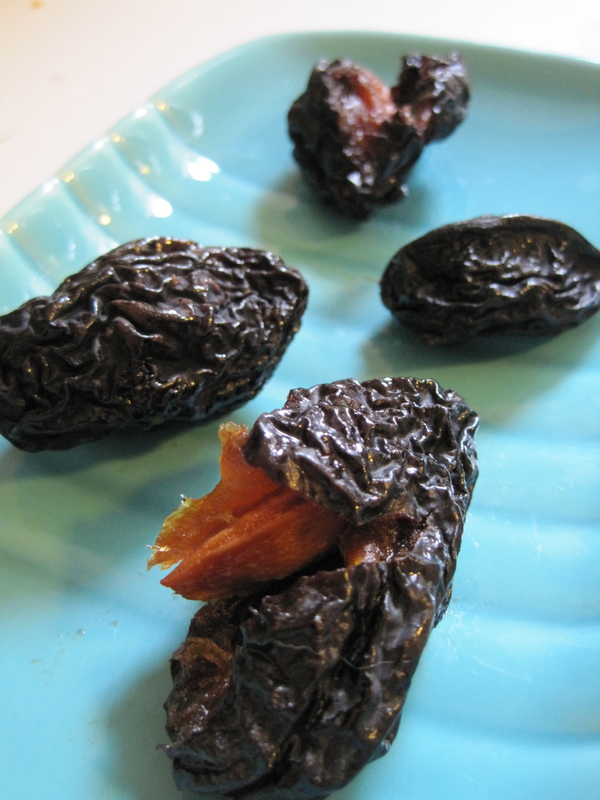 Put the prunes into a large nonreactive saucepan and cover them with water. Bring the contents to a boil and then reduce the heat. Simmer the prunes for 15 to 20 minutes. Empty the saucepan into a sieve set over a bowl. Return 1 cup of the cooking liquid to the saucepan (if there isn’t 1 cup liquid, add enough water to make 1 cup). Add the sugar, vinegar, and spices to the saucepan. Bring the mixture to a boil, stirring to dissolve the sugar, and reduce the heat. Simmer the mixture for 10 minutes. Add the prunes to the saucepan. Simmer them for 5 minutes. Put the prunes and their liquid into a quart jar and cap the jar. When the jar has cooled, store it in the refrigerator. 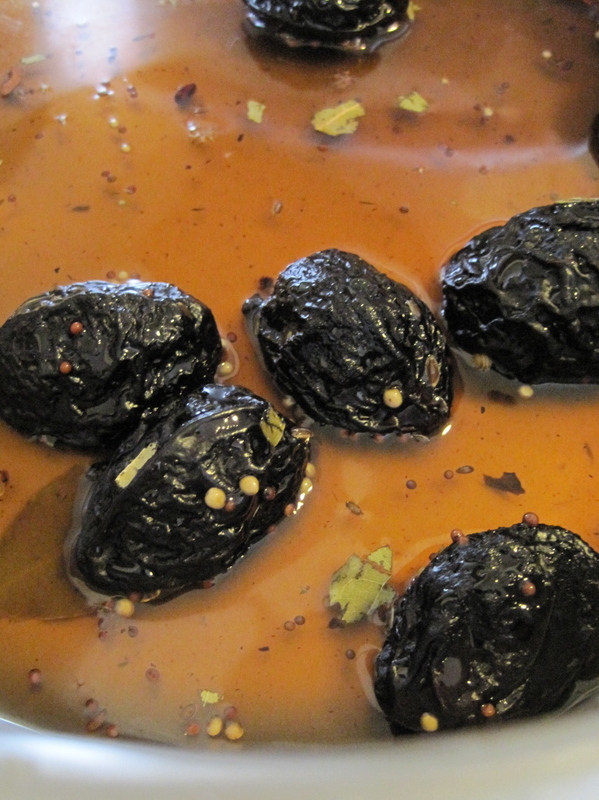 After a day or two, the prunes will be ready to eat. They will keep well for several weeks, at least.